These little notecards were SO easy to make. I used American Crafts POW! Glitter Paper and it cuts like butter in the eCraft and no glittery mess afterwards. I seriously did not find one grain of loose glitter. LOVE IT! The cuts are from the eCraft Office Essentials SD card and are photo corners, but when put together, they make a really cool frame. There are a lot of really pretty photo corners on this card. I just adhered them on a sqaure piece of white cardstock and stamped my sentiment in the middle and then used dimensional adhesive to attach it to the card base. Have a great day, and in case I'm not back here this weekend, Happy 4th of July to all my US friends! A Non Sporty Card made from Sports Life! I mentioned the other day that there is a category on the eCraft Sports Life SD card that is called Spectator & Awards. Well in that category are all sorts of things that can be used for non-sporting events as well. 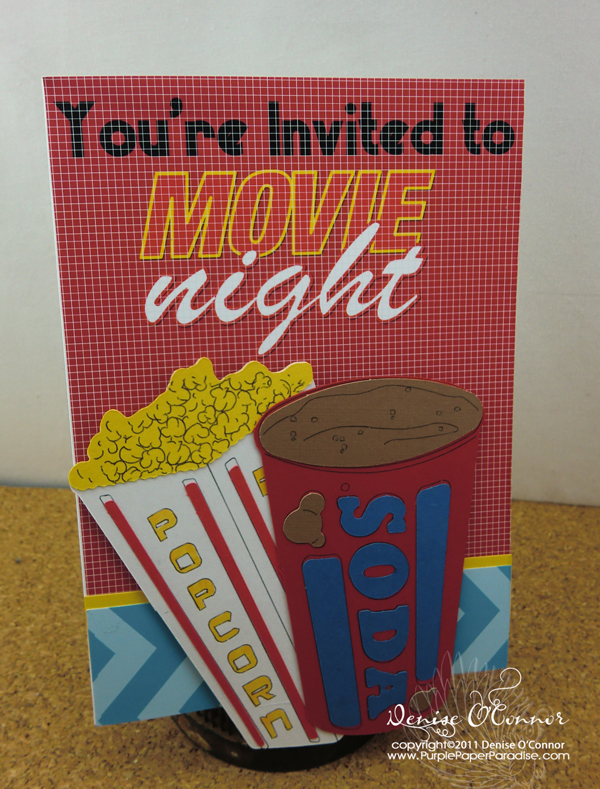 So for this card, I cut out the popcorn box and the soda. On the popcorn box, I cut out all layers and colored in the words on the popcorn box with my Copics (again...be careful!). The soda is cut with all layers. For the background, I did some magic with my PSE 8 and some digi paper, graphic files, and fonts. Love this card! I am going to have to plan a special movie night for my DH so that I have an excuse to give him this card! Tomorrow is a super simple card (or a set of 3) that I made using a single cut from Office Essentials and some FABULOUS new paper that I just got! How Many eCraft Cuts Can I Get on a Single Card? Well for a standard A2 sized card, I got a total of 5! The eCraft Office Essentials SD card designed by Laina Lamb is so versatile. 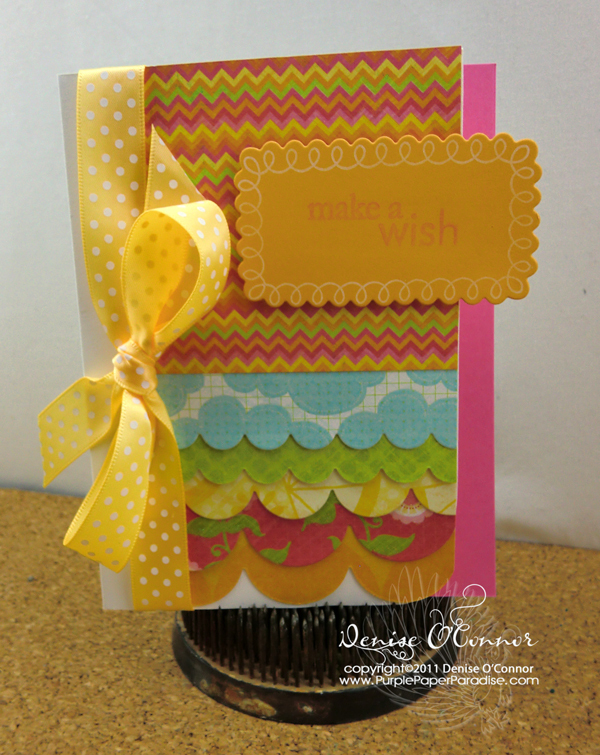 There are a lot of things on this card that can be used for a wide variety of occasions. On this card, I cut 2 of the Notebook Page with the round holes (there is also a square hole option) out of 2 coordinating patterned papers from the Papertrey Ink Road Trip pack. I also cut out the Rolodex card from some vintage bookprint. Then I cut out the bookplate and the "Just a Note" sentiment. I may have gotten a bit carried away with this card, but the papers were so pretty and believe it or not, there were some other cuts that I made that got eliminated from this card. Tomorrow I will be showing you a non-sporty card made from the Sports Life card. I hope Mr. Miyagi would approve! I knew when I saw all the karate images on the Sports Life eCraft SD card that I just had to make something with one of them. 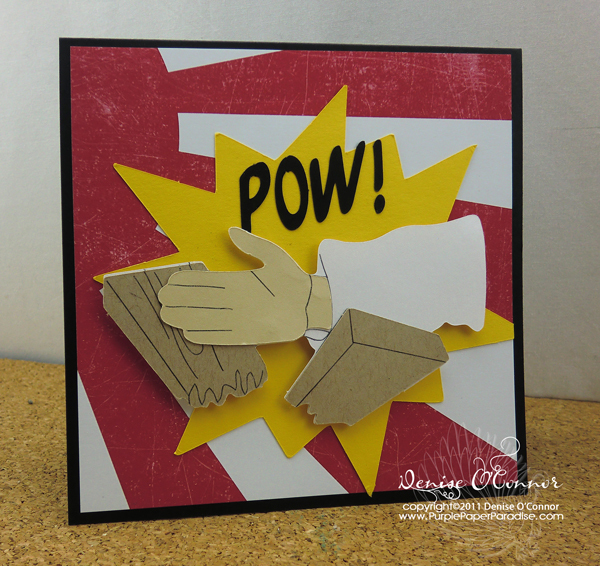 My son has been invited to a karate themed birthday party and so of course, I need to make a card for the birthday boy! I just loved this image of the hand chopping a piece of wood, I mean isn't that the ultimate goal if you study karate! On top of that, it is only three cuts to complete the look so that is easy. I made the yellow starburst in Inkscape and cut it out with the eCraftshop Pro software along with the POW! which was made using Lettering Delights LD Kazaam font. 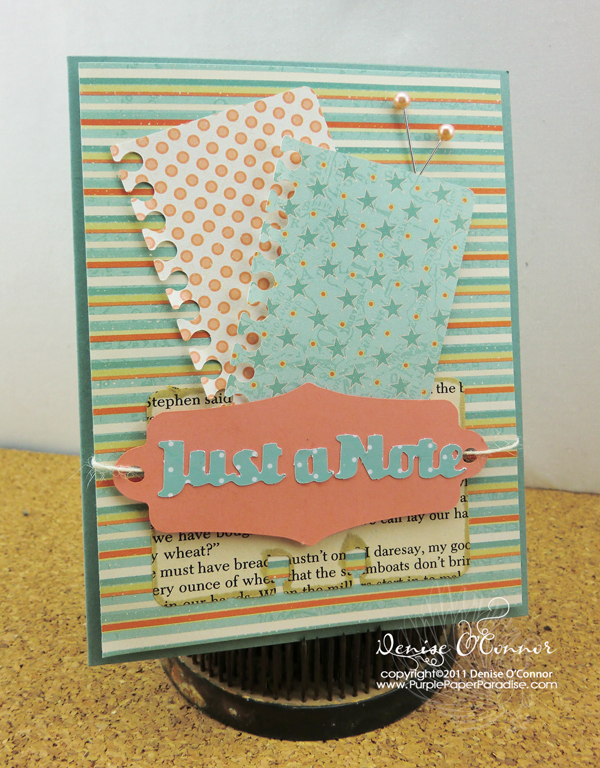 The patterned paper is from the Lettering Delights Ninja Kicks paper pack and adds just that little extra punch! Well when I saw some of the mail themed images on the eCraft Office Essentials SD card designed by Laina Lamb, I just had to use them. It also didn't hurt that I had the Papertrey Ink Postmarks stamp set and Postmarks Patterned Paper that would go perfectly with these cuts! The SD card has the letter outline shape and the stamp shape that I used in this card. For the letter, I just cut a piece of cream cardstock to back it so I could add some stamps on top of it. 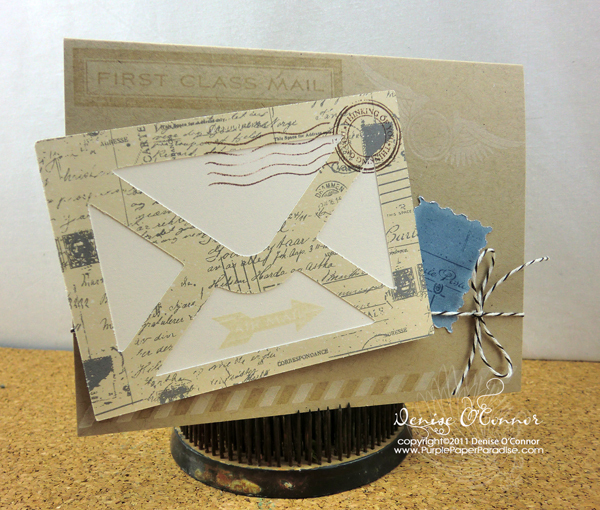 This card went together super fast, the hardest part was figuring out which stamps to pair up with these cuts. 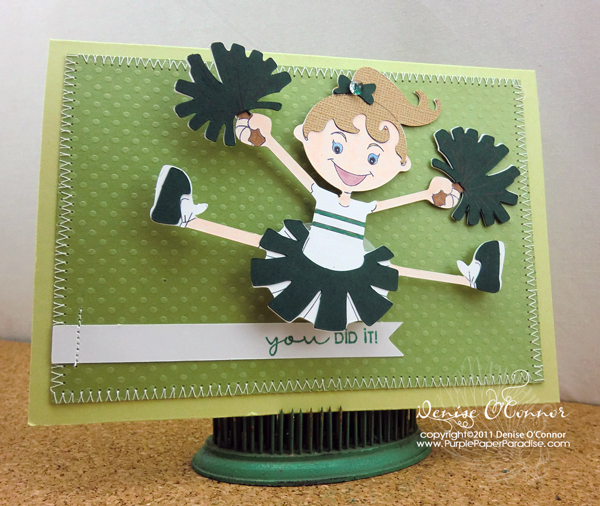 Tomorrow I will have another sporty card to share with you! I think Blogger is playing games with me! Sorry for any confusion, but last night Blogger posted a post that I had saved that was going to go up later in the week. Hopefully everything is on track now! Another new card will be posted tomorrow! Don't you just love it when inspiration hits you like a brick? That is exactly what happened with me when I read the saying that I used on this card! Every now and then, when someone in my life is going through a difficult time, I like to give them a card to let them know that I care and hopefully lift them up a bit. I think that this saying is just perfect for such an occasion. Since I did not make this for anyone in paticular, I wanted to use a neutral color palette so that it can be given to a man or a woman when it is needed. The saying of course just shouted "Nautical Theme!!! 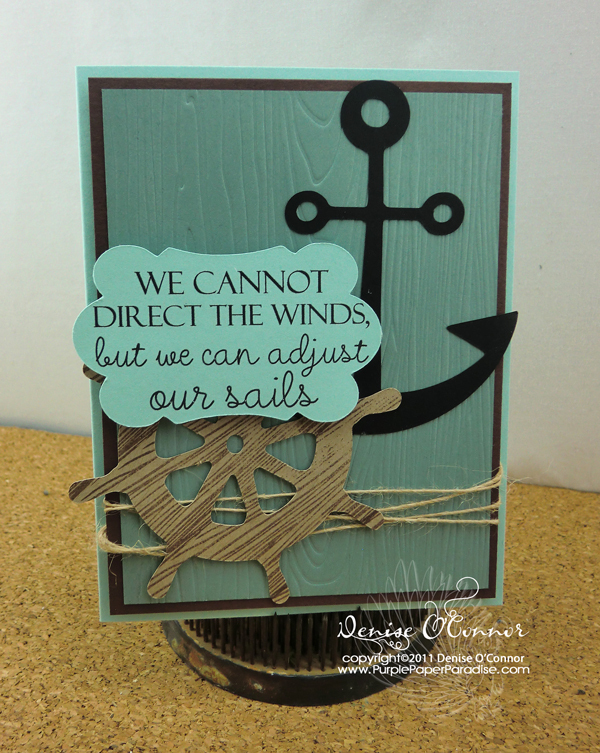 ", so I turned to the eCraft Sports Life SD card and found the anchor and the wheel (along with several other nautical type cuts) and then I paired it up with this wonderful frame from Laina Lamb's Office Essentials SD card. There is a whole category for frames on the card! The wheel was stamped with Papertrey Ink's Woodgrain stamp set, and the background was impressed with the coordinating Impression Plate. A little jute twine completed the look! YAHOO! I got some new eCraft SD Cards! I recently received a very generous gift of 2 eCraft SD cards (Thanks Emily!). I got Sports Life and Office Essentials, and I thought the only thing to do is to make a bunch of cards with these cards and share them here with all of you. Now, I have to tell you...I am not a "Sports" person. Even though I am a mom of 2 boys, neither one of them have gravitated to a sport yet. I am sure that when they do, I will become the biggest fan of that sport and of course the proud mama of my little athletes. As I was looking through the images on the Sports Life eCraft SD card, I was really surprised. This card covers just about every sport I could think of. There are images on here for Football, Baseball, Soccer, Lacrosse, Track, Basketball, Hockey, Ice Skating, Fencing, Gymnastics, Sailing, Rowing, Fishing, Swimming, Diving, Weight Lifting, Boxing, Wrestling, Horseback Riding, Rodeo, Tennis, Volleyball, Golf, and Karate. On top of that, there is a category full of Spectator and Award items, and a font. So even though I am not a sports person, there is plenty here for me to play with. Let's start with this cutie cheerleader! I did something a little different with this cut. I used some of the onlay pieces (mainly the darker green pieces and the hair) and then for the rest of it, I treated it like a stamp and colored it with my Copics. Now I have to warn you, the eCraft pen is not Copic approved and you have to be really careful to not go over any of the pen lines because you will end up with a mess (don't ask me how I know this). I can only hope that maybe one day Craftwell will come out with pens for the eCraft that work with Copic markers because this was so much fun and a lot of the eCraft images I think would work well this way. The other thing that I did different with this cutie is that I used an Action Wobble to attach her to the card. If you haven't seen these, they are very cool. When you attach something with an Action Wobble, the item will bounce around and it stays securely onto the card. And trust me it does stay securely, I put it to a good test and this little cheerleader looks like she is really jumping up for joy. So much fun! 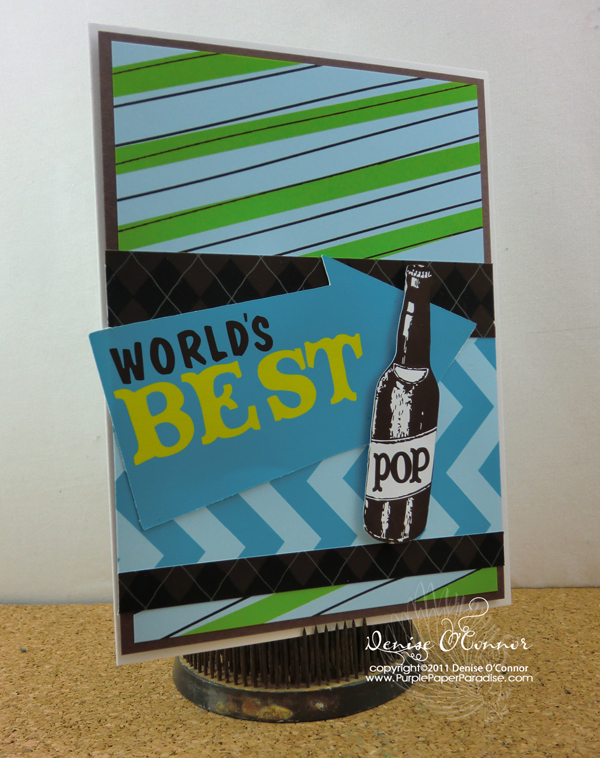 Tomorrow I will share with you a card I made from the Office Essentials eCraft SD card! Holy Cow it's been awhile! I cannot believe how long it has been since I posted something! Well, since Father's Day is right around the corner, I thought I would share with you the Father's Day cards that I have made. First up is one for my Father-in-Law. My FIL is a lover of trains as is my youngest son, so I tend to make a few things with trains. This one just needed to be cut in all black (with the exception of the smoke) and I decided to try to do this as an all neutral card. 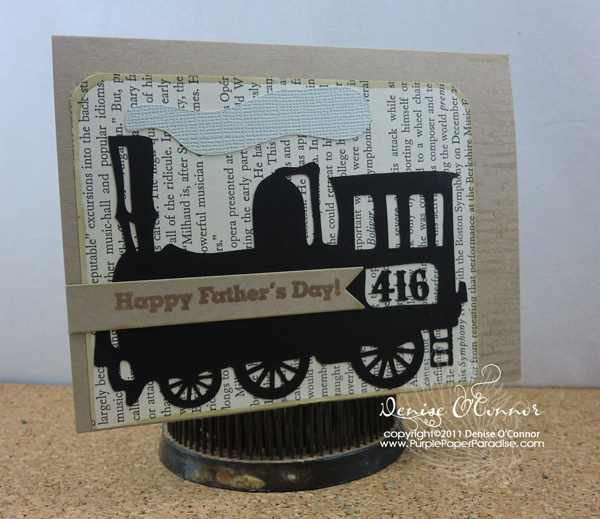 I mounted the train onto some vintage bookprint and I used some stamps from the My Hero My Father stamp set from Papertrey Ink. That includes the sentiment and the wonderful corrugated stamp. 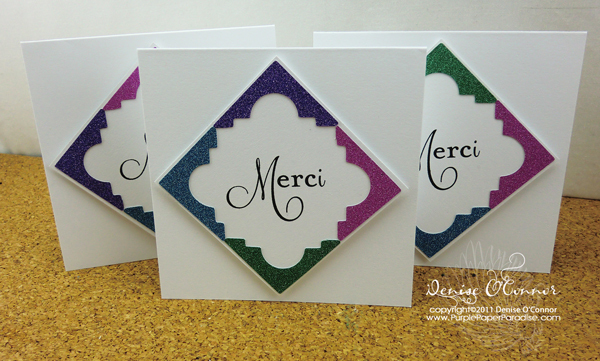 Both were stamped in Versamark, and then I heat embossed the sentiment with clear embossing powder. Love how this card turned out! I just may have to do more all neutral cards! I will admit that this card which is for my Dad is not my favorite. 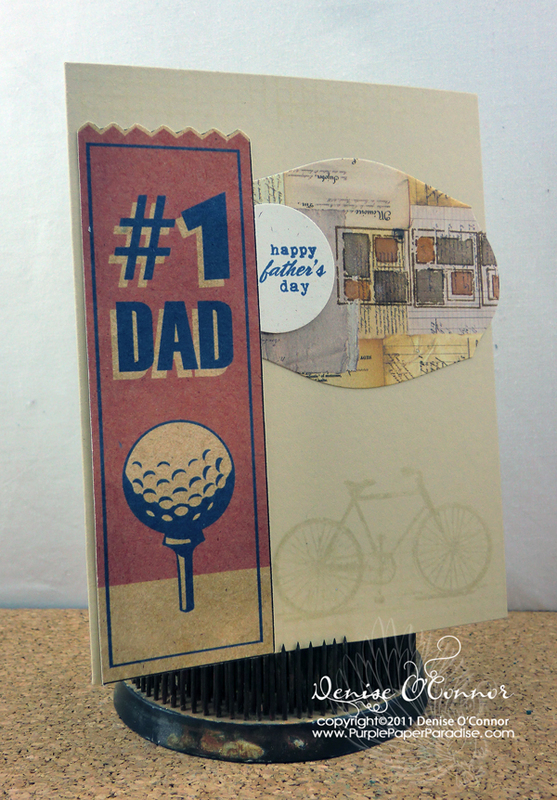 I just may make another card to replace this one, but I may not have the time between now and Father's Day. My Dad is a lover of two things, golf and bicycling. So I found this #1 Dad graphic with the golf ball from Lettering Delights and just knew I had to use it. I also had this Tim Holtz bicycle stamp in my stash that was crying out to be used, and I am just not sure that I merged the two well enough together. When it came to making a card for my husband, I was at a loss. Then as I was scrolling through the Lettering Delights website I came across THIS file. While I was looking at this, I realized that I had all the elements to make a pretty good replica of this card, so I set to work. This also is just perfect, because for Father's Day the kids and I got him a Sodastream. Not sure if we are actually going to like this, but my hubby loves gadgets so it is one of those things that I knew he would like to get and play around with. Hope all of you have a wonderful Father's Day and let's show the men in our lives how much we appreciate them! The other day, the kids were driving me crazy! So I decided that Mommy needed a time out, and I went into the solitude of my craft room and made this card in like 10 min. It was just enough to calm me down so I could be a relaxed Mommy. I also amazed myself that I was able to finish it so quickly! I took a stack of K&Company paper and just started to cut diffrent sizes of scallops and threw this all together and I love how it turned out. The label and sentiment is from the Fillable Frames series at Papertrey Ink. I just realized that I completely forgot to share this card! This card was for my MIL. My MIL loves flowers, especially buying them. It is a running joke in our family that she will go buy flowers intending to plant them, but somehow they never do. This year she bought a bunch of flowers and my FIL saw them sitting there and could not stand to see these flowers die the death that usually happens, so he asked one of his employees who loves gardening to come over and get them planted which she did. Finally a year without dying flowers! 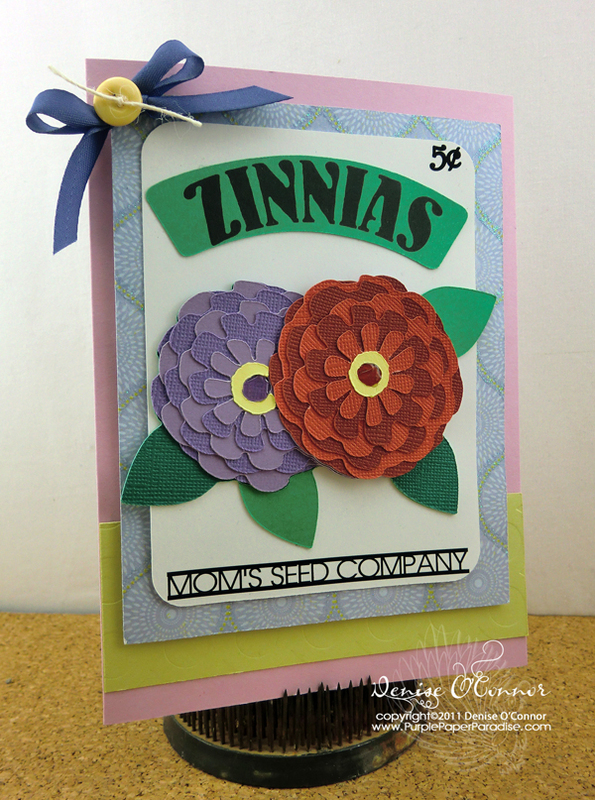 The Zinnia seed packet is an SVG from Lettering Delights' Bee Yourself SVG set. There are A LOT of layers to this card, so if you decide to cut these, make sure that you have a larger envelope than normal to accommodate the extra bulk. I used the printing technique for the Zinnia label and the 5 cents marking. The original file has "Smith's Seed Company" listed at the bottom, but I decided to make my own to fit with the occasion and I printed that as well.